Cricket isn’t just a game, it’s a British tradition. And, like all things British, there’s a proper way to go about it. Cricket most likely began as a children’s game in the 15th or 16th century, so it’s really simple at heart. Hit ball with bat. Chase ball. Repeat. Eventually, adults picked up cricket, beginning with farming communities and moving on to the British aristocracy, leading to super-complicated variations in the rules of the game. 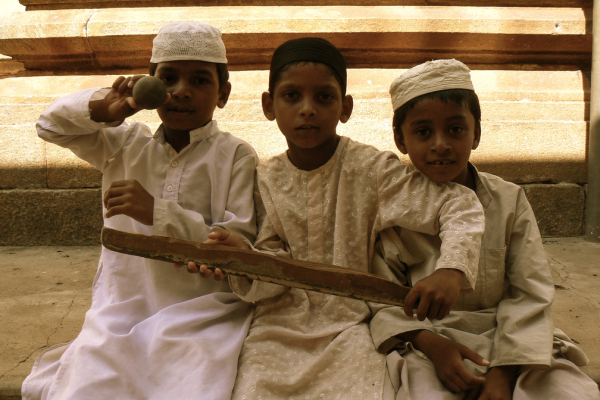 Any game of cricket requires a bat, a cricket ball (made of cork and covered with leather) and two sets of three stumps (long wooden stakes). Professional players also use protective gear, like helmets, gloves, and groin guards. Cricket is played between two teams of eleven players each. Each team is composed of specialist batsmen, bowlers, all-rounders, and a wicket keeper. Two on-field umpires, an off-field umpire, and a match referee officiate. Each game is split into innings, where each team gets to bat while the other bowls (equivalent to pitching in baseball). Each inning is split into segments called “overs”, groups of six deliveries in a row by one bowler from a particular end. Bowling duties rotate with every over. At the end of the game, the team with the most runs is declared the winner. Cricket is played on a grass field, at the center of which is a 22-yard strip known as the “wicket” or the “pitch.” This is where most of the action takes place. The wicket is marked on either end with three wooden stumps lodged into the ground. On top of the stumps balance two small wooden pieces, called bails. 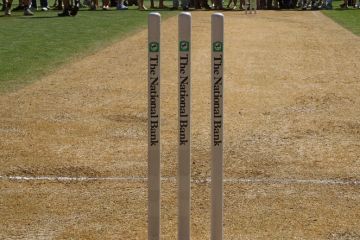 In professional matches, the stumps contain tiny cameras to capture on-pitch action and vital close-ups. The game itself begins with two batsmen making their way to the pitch while the opposing team takes to the field. Batsmen try to score points by hitting the ball and running back and forth along the wicket. If the batsman hits the ball past the boundary line, the batting team is awarded four runs automatically. If he hits it out of the ground limit, the team receives six runs. The bowlers and fielders work at dismissing, or “getting out”, the batsmen, one at a time. The common methods of dismissing a batsman include dislodging the stumps, catching the ball before it hits the ground, and trapping him in front of the stumps. Once all the batsmen have been dismissed or the stipulated time is up, the inning ends. 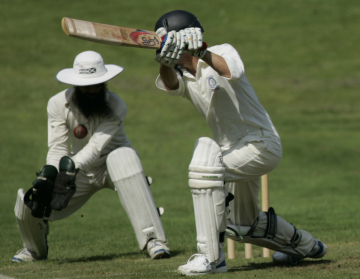 Test cricket – the classic form of cricket. It is played over five days, and is often considered to be the true trial of a cricketer’s skill. Test cricket is played in whites, a la Wimbledon. One day internationals – Born in the 1970s, complete with colored uniforms. ODIs are played in two innings of 50 overs, with each team facing 300 deliveries. Though purists claimed the format would never last, the one-day format led to the formation of cricket’s most prestigious tournament, the Cricket World Cup. Twenty-twenty – the Twitter of Cricket formats. Added to the international calendar in 2005, twenty-twenty cricket – or T20, as it’s commonly known – is played in short bursts of 20 overs each. As the fastest-paced and most action-packed of cricket’s formats, twenty-twenty matches are usually concluded in less than 3 hours. T20 also led to the formation of the Indian Premier League (IPL), a professional cricket league based on the structure of European football leagues. It’s a money spinner, both for players and the Indian Cricket Board, and some IPL cricketers earn as much as top English footballers. Those are the basics: welcome to the tip of the cricketing iceberg. Still have questions about cricket? Ask them in the comments section!